Do you remember those phone calls home, the ones you made after ‘leaving the nest’ for the first time? I do, and from a pay phone. My sister remembers, too, offering sentiments recently that it would be nice to make those calls, again. But, we can’t, of course. I remember the calls and can ‘see’ it in my mind’s eye. Mother would answer, as the official ‘answerer’, and in a soft voice, I’d hear, “Hello?”, in a questioning way. The uncertainty was gone and the enthusiasm returned, once she knew who it was. We’d talk and she would hand the phone to my father, nearby, and we’d talk some more, often repeating myself, a bit louder each time. I could sense the ‘changes’. Remember asking to reverse the charges? She always accepted them. Long distance calls weren’t cheap so we limited the frequency and duration. Over time, the phones changed, cords went away and buttons replaced dials. The nature of the calls changed, too, from ‘just called to talk’ to ‘how are you feeling’. Eventually, with time passing, so do the people you love…the calls stopped. Yesterday, the old family telephone number flashed into my memory, Pleasant-48756. Don’t know why, but it did, and it opened a floodgate of memories, good memories. Initially, our number was just five digit characters, 48756, but as telephone service demand grew, so did the creativity of assigning numbers, longer numbers, with letters. 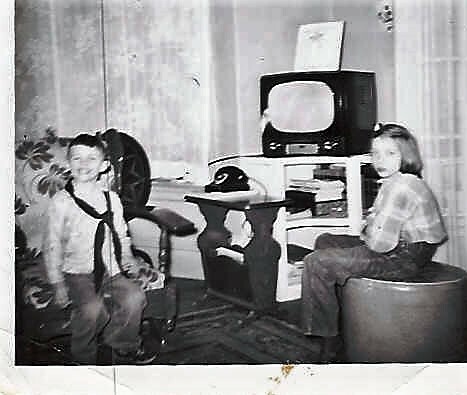 The phone was ‘anchored’ on a small living room table, the ‘phone table’. It was a cumbersome black unit with a circular number scheme in a dial fôrmat, corded to the wall. More importantly, the mouth/ear piece was corded to the base, and cradled on it when not in use. You never lost the phone because it was ‘anchored’ in the same spot for years. The telephone kept families connected. Every bit of emotion could be sensed over the lines. Good news and bad news was delivered over the telephone, by voice. We made plans and had private rendezvous with special friends. Of course, with the phone anchored to a spot, that privacy was problematic. We all have mobile phones now, several to a family. No need to remember the numbers, just ask the phone to call by name. You can send text messages and avoid speaking to the other party. Play games and music and get easily distracted by the new phone capabilities. You can even wear the phone like a watch, well, it is a watch, too. Yes, we’ve come that far. Progress, I guess. After high school graduation and between college semester breaks, summertime found me working for my dad’s painting company. Truth be told, I did little actual painting. But there were plenty of other tasks to support the real journeymen painters, low skilled tasks that a ‘college kid’ could easily master; scraping, sanding, dusting and hauling, to name a few. I abhorred it. However, I did get an ‘education’ on hard work and found one task that was simple and perfectly suited to my teenage laziness, the ‘runner’. When it was mid morning break time, I collected the painters’ money and went for their food and drink, generally coffee and a sweet roll, or donut. The workers’ break was 10 minutes by union rules, but for me, it was a good 30 to 45 minutes, because I was the ‘runner’. I became familiar with the likes and dislikes of the men on the jobs, and listened attentively to their ‘sage’ advice. Naturally, I ignored it, I was a ‘college kid’. Coffee was not part of my regimen, then, and I already had some hair on my chest, at least it was starting, so the suggestion didn’t sway me. I often heard the same admonition from my ‘old school’ father when I was a kid; “eat it (drink it, take it), it’s good for you, and it’ll put hair on your chest”, my father would urge. Why would a ten year old kid want hair on his chest? Eventually, I joined the throng of coffee drinkers. It wasn’t the macho world of laboring men who got me started, however. My caffeine fix began with ‘Gussie’, my future mother-in-law, who always had a pot of coffee brewing in her kitchen. The aroma of percolating coffee, aaahhhh, it was addicting and ‘Gussie’ drank it black. There’s a certain intoxication in that very aroma, isn’t there? And, if it could only taste as good as it smelled, with no additives, then black would be my choice, as well. Years later, my sales job reinforced the black option. On the road several days a week, coffee became a staple of my morning routine and a stimulant during day time drive times. Who has time to mix in a creamer or sugar packet when you’re hustling to an appointment? Pull in to the fast food drive-thru, order, pay, then grab ‘n go. I still drink coffee, black. And, yes, I have hair on my chest. ‘Gussie ‘ is gone for many years, now. And, if your wondering, I never asked…and she never mentioned ‘it’. “Double your pleasure, Double your fun, ………..
Do you remember this rhyme from an old television commercial? Usually, there were a couple of twin girls who sang the jingle. If you can finish it, then you’re of a certain generation. Many people watched the Super Bowl for the entertainment pleasure of the ads as much as the actual game. Over the years, the Super Bowl has rewarded us with some of the best advertising money can buy, as millions of dollars were spent on brief but entertaining commercials. This year’s Super Bowl ads, for the most part, were disappointing for message and humor. The Doritos ad with Chance the Rapper and The Backstreet Boys was pretty good, but other than that, ‘Meh’! However, outside the Super Bowl, there have been some catchy ads over the years that are seared in our memories for both content and entertainment. Let’s have some fun, see if you can fill in the blanks of some of the old time ads. I’m sure you can do it…before looking at the answers. 4. Go Greyhound, and ………. 5. You’re in good hands ………. 6. Lucky Strike means ………. 7. Brylcreem, a little dab will do ya, ………. 8. See the USA ………. 9. Maxwell House coffee, Good ………. 10. Takes a lickin’ and ………. Coffee commercials were very popular years ago and cigarette ads dominated the airwaves until they were banned. Remember Wendy Hamburger’s line and the Little old lady who shouted, “Where’s the beef?” Everyone was saying it. Miller beer advertised their lite beer with a theme, ‘less filling, tastes great’. Celebrities would humorously debate which it was. Can you think of some old time goodies? Sure you can, give us one or two and your score. 9. to the last drop!